I gave my girlfriend Elvira a couple of technical ice axes Last Xmas and promised to teach her how to use them - lucky her :-) A couple of months later we went to Ouray Ice Park, which is the perfect place to learn how to ice climb due to the ~150 routes in all grades located within 10 minutes walk of the parking lot. We planned to stay there for two weeks but after a couple of hours in the park I realized that this was a big mistake! Elvira didn't like the cold (although it was perfect ice climbing conditions with sun, no wind and -5°C) and the falling ice! We did climb a couple of routes, but in the evening we agreed to move south into the sun! 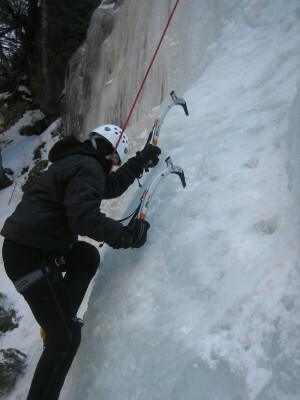 Elvira toproping in Ouray Ice Park. 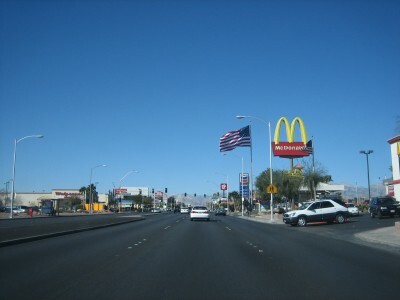 Charleston boulevard in Las Vegas leading to Red Rock Canyon National Conservation Area where all the good climbing is! I had previously been in Las Vegas in 1993 and thus knew what awaited me, whereas Elvira was taken aback by the craziness of the city. Hummer limos, casinos, drunk people, prostitutes and what not everywhere near the strip. 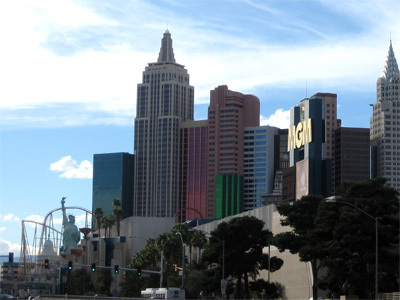 New York New York Casino - it is quite silly how the casinos try to differentiate themselves by themes - when it comes down to the gambling they are all the same. We only had one problem left: ice screws and big boots were not ideal for rock climbing and we had no guidebook..... We went to the Desert Rock Sports shop and bought friends, climbing shoes, chalk bags and a climbing guide. The guy in the shop was extremely helpful and wrote down a lot of good route suggestions and recommended starting with some of the bolted sport climbs so we could get used to the sandstone. Flyers with all kinds of "Specials" were everywhere in Sin City. Well, it was fun seeing Las Vegas for a couple of nights, but we quickly agreed to move out near the rocks as soon as possible. 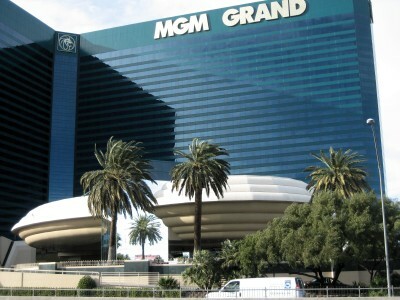 MGM Grand Hotel where we saw the fantastic Cirque du Soleil show "Ka"! Luckily, the guy in the climbing shop recommended staying at Bonnie Springs Motel - a remote western town at the foot of the Red Rocks. 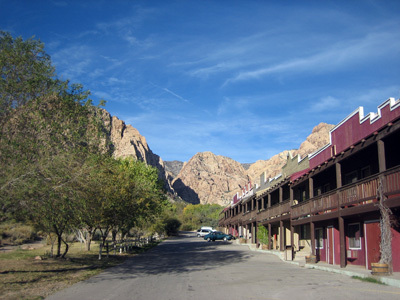 Bonnie Springs Motel - located on "1 Gunfighter Lane" to no surprise! A funny place with an old western-like atmosphere. I was kind of expecting John Wayne to ride into the motel city with a bunch of Indians chasing him any time I was there.... What a contrast to Las Vegas and I can highly recommend the place. Bonnie Springs Motel at night.